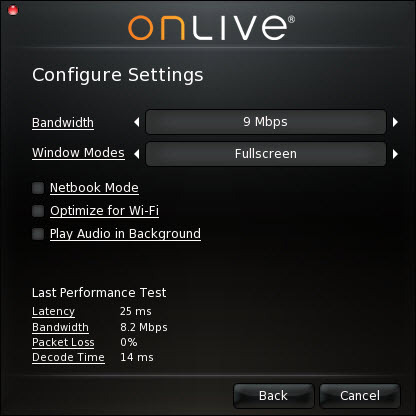 To date OnLive gamers were able to stream their games from OnLive's data centers with a speed of up to 6.5 Mb. Many were complaining that they could stream with a higher speed and that way have a better picture quality if OnLive let them. Well, OnLive has now listened to those complaints and upped the streaming speed up to 12 Mb which comes with a noticeable increase in picture quality. To enable the higher speeds and change other options OnLive gamers have to select the 'more settings...' option on the OnLive sign in screen. Those new options are only available on the PC and Mac clients. 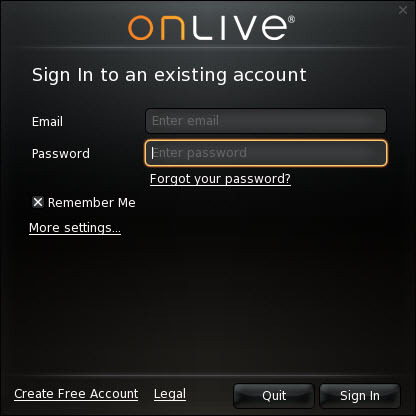 The OnLive Game System, the OnLive Android client and the OnLive Google TV client will have to wait. From there they can select from a bandwidth speed of 3 Mb up to 12 Mb. The default option is automatic. They can also select window modes like Low Latency Fullscreen, Fullscreen and Windowed. There are even more options like netbook mode, optimize for Wi-Fi, play audio in background, and you can even turn on and off vertical sync. Those are all great options. With the play audio in background option enabled you can now finally hear the audio from the OnLive cloud gaming service even when you have the OnLive application in windowed mode and use another application, that way not missing what's happening in the OnLive service. By turning off vsnyc the streamed frames get displayed as soon as they are decoded which can reduce latency, but the danger is of course that screen tearing can happen. The Mac client lacks the Low Latency Fullscreen and vsnyc options. There are still some nagging problems like occasional lag spikes and game crashes. But they are not all OnLive's problems as the higher bandwidth options require sustained internet speeds to run them stable. 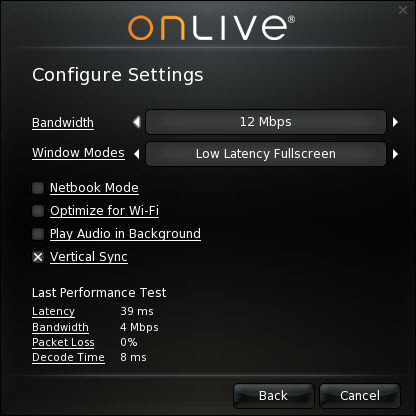 For that OnLive has included a performance test that runs each time you start up the OnLive client and displays latency, bandwidth, and packet loss to OnLive's servers. They also measure the video decode time on your PC or Mac. Interestingly the performance test only measures a maximum bandwidth speed of 8.2 Mb no matter if your connection is faster, though the OnLive client does use up to 12 Mb. Let me address a few things. First off, this community's feedback is invaluable for prepping my team for customer inquiries around the new features. While we are very much aware of the intended benefits, how they impact the experience in the broader community gives us great clarity in what to expect. We've already received some tickets from you guys which we very much appreciate. We are investigating the reports of increases in lag to determine what might be happening there. As Tig reported on my discussion with him, the quiet release of these features is intended to put it out into the wild and gather settings vs performance data. As for the difference between Low Latency Fullscreen and Fullscreen, I'm allowed to say that it makes use of some advantages in Windows to, as you'd guess, reduce latency in the interaction with the Service. You'll likely notice that Alt-Tabbing is a little rougher with Low Latency Fullscreen selected. If you deselect Vertical Sync, you may see some tearing in the image. If you do, simply re-select it and that artifacting will go away. These are options only available on the PC Client. Currently, there is no info on when we plan releasing the settings on the MC client. I'm really glad to hear that for most of you, there seems to be a marked improvement in the visuals. The new client provides OnLive Tech Support with invaluable info in getting unadulterated figures on the reality of speeds, latency, packet loss, and decode time. You would find out that all the tips are just so common sense.